PLANED supports communities of place and interest; helping them to be stronger, more economic and resilient; and encouraging best practice by seizing opportunities to do things for themselves. PLANED supportsthecommunity voice to be heard by encouraging collective action and discussion at a community level. Through development of action plans and community forums, PLANED support the resilience of rural communties by identifying opportunities for community based facilities, ensuring communities have access to the services afforded to more urban settlements through partnership and innovation, and development of rural services to meet the needs of the community. We will encourage improved wellbeing and integration by helping communities to experience ‘The Five Ways to Wellbeing’. 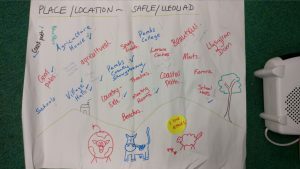 We use bespoke community focused tools and methodologies to engage with the community. 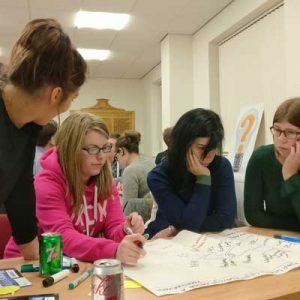 We use a variety of engagement methods ‘Visioning’, Surveys, Action Research, Asset based development, online forums and discussions, community conversations (eg. Cabon conversations), Youth engagement, theory of change, mapping, events and arts. An Action Plan provides an overview of the whole community, identifies local need and local opportunities, represents a forward look at the changes a community wants to see, and identifies the organisations needed to help implement the Plan. These Action Plans can lead to the strengthening of existing groups and creation of new ones, the enhancement and creation of local amenities and new opportunities to link into strategies and Hub Area Development Plans. d and supported to establish relevant working groups to take forward specific project proposals identified in the Action Plan. Projects are identified in Community Action Plans and Hub Area Development Plans. PLANED’s approach at ‘turning ideas into action’ encourages working groups to look at strengths and opportunities that exist locally, for specific projects what can be done locally and who can help, and then identify the nex t steps, for example liaising with service providers etc. Through a number of initiatives PLANED may be able to offer financial support for projects identified in Community Action Plans and Hub Area Development Plans which contribute to local regeneration and economic growth. In order to work together effectively and to progress a Community Action Plan, local people are encouraged to form a Community Forum. A properly constituted Community Forum enables people and organisations to come together and be represented at community level. PLANED also assists communities to collaborate and network. PLANED has established and continues to support a Community Forum Network, whose purpose is to bring together Community Forums and Associations to share experience and good practice, along with Community, Town and City Councils and other agencies. The Forum meets twice yearly and is an opportunity for communities to discuss challenges and solutions across the country. 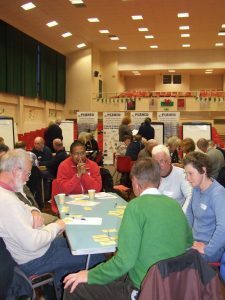 The Pembrokeshire Community Buildings Forum brings together representatives from community buildings throughout Pembrokeshire. It provides an opportunity to network and discuss issues that affect community buildings, as well as providing updates on current funding and relevant changes in legislation. The network meets twice a year, in one of the community buildings that are represented on the network and is co-ordinated by a steering group with representatives from PAVS, PLANED & PCC.